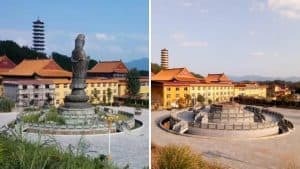 Chinese believers are finding that their travel is being monitored or prohibited. They fear social credit system and growing pressure on family members. 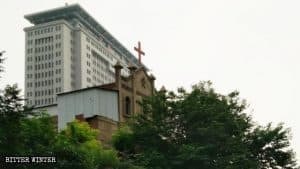 The Chinese Communist Party (CCP) authorities have been registering the personal information of religious believers on a comprehensive scale. The data collection is nationwide, centralized into a unified database, and associated with a similar collection of data on religious venues. Religious and human rights advocates are concerned that this information will be integrated into China’s so-called “social credit system,” and could be used as a powerful weapon against believers. In 2014, the State Council promulgated a Planning Outline for the Construction of a Social Credit System (2014 to 2020), with pilot trials set up in various regions. The goal is that the system will be fully implemented in 2020. Reportedly, all daily activities will be factors in determining one’s credit score. Points will be deducted for “pestering” the government or enterprises; for defaming others online; or for making or selling counterfeit goods. This score will determine whether one can travel out of town; whether one can be promoted at work; whether one can buy a car or property; and even what kind of school one’s children can attend. The authorities claim the social credit system will create a “culture of integrity” and increase “the level of credibility of the entire society.” Some believe, however, that it is another tool for those in power to monitor citizens and violate human rights. According to Guangming Daily, a national Chinese newspaper, since the social credit system pilots began, 7.33 million people have been restricted from buying plane tickets due to “losing credit;” 2.76 million people have been restricted from buying high-speed rail tickets. 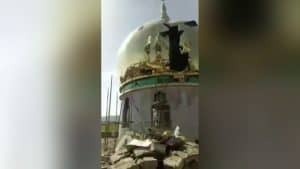 Travel restrictions are also impacting religious believers. Aside from the difficulties these restrictions cause to believers themselves, the similarity between travel restrictions placed on religious believers and those suffered by people with poor “social credit” raises a question: has the data collection on religious believers already been integrated into the social credit system? The case of an elderly woman in her seventies, Mrs. Li (a pseudonym), is typical of believers facing restrictions and harassment in travel. On October 3, 2017, Mrs. Li and her husband were at a high-speed train station preparing to visit their relatives out of town. 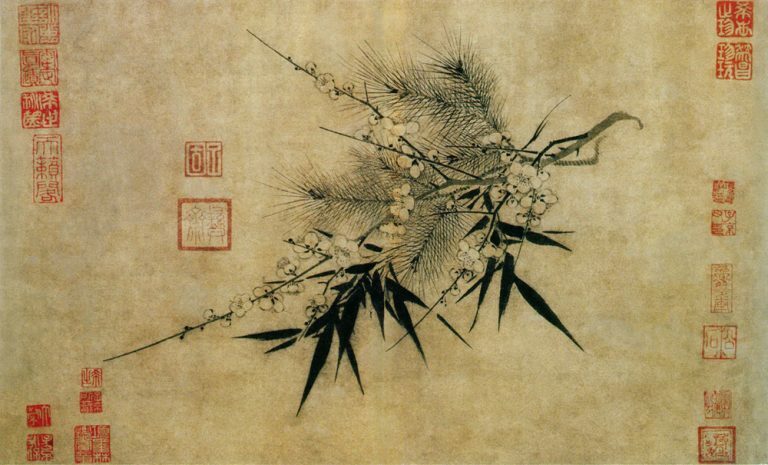 At this time, Mrs. Li’s name was called over the hall’s broadcast system, demanding that she hurry to the security room. Upon arrival at security, Mrs. Li was required to open all of her carry-on packages and place the contents on a chair to be photographed. 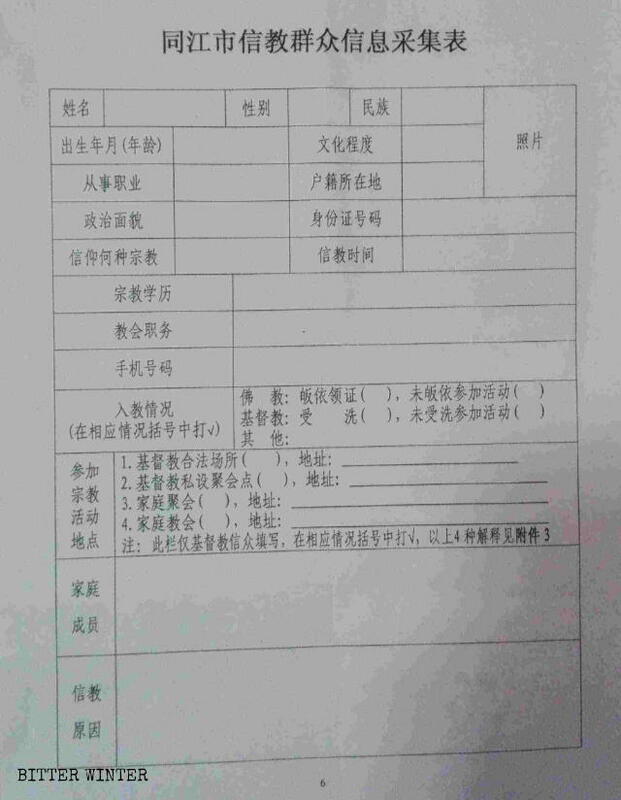 The police also photographed Mrs. Li herself, and her ID card and train ticket. The officers told the couple that they must report to the local police station after returning from their trip. When she left the security room, Mrs. Li felt ashamed as her gaze met the eyes of her fellow citizens, suspicious of why she had been interrogated by the police. On her return trip home, three days later, she was forced to go through the same humiliating experience again. The reason that Mrs. Li received such “special treatment” is because her personal information was registered by the government more than ten years ago when she participated in a house church gathering associated with the Local Church, a Chinese Christian religious movement. Names of family members and addresses; their workplaces and addresses. 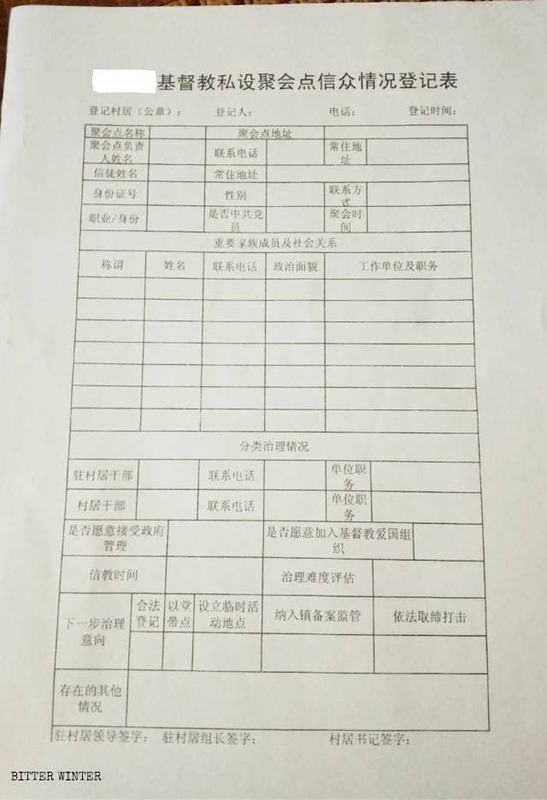 A form for basic information on religious people in Tongjiang city in Heilongjiang Province. Every believer from the government-approved Protestant Three-Self Church and the house churches, as well as Catholic, Buddhists, and Daoist believers are expected to fill out these forms. The information has been – at least until recently – collected in paper form by local officials (generally county-level) of the religious affairs bureaus or the CCP. 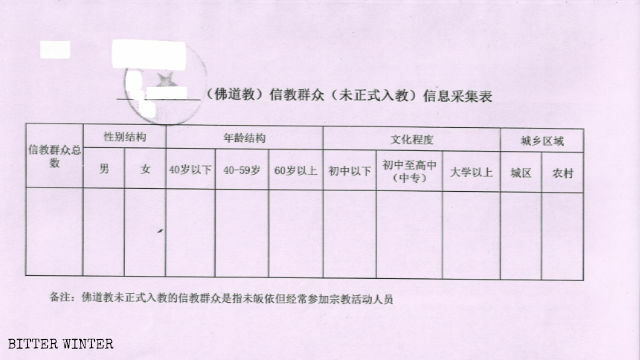 The paper forms are then compiled by local officials into “statistical investigation” tables (with aggregate data about the number of registered believers, their age ranges, gender, education, etc.) and are later inputted into a national database. For those who are part of “private,” “foreign infiltrative,” or xie jiao (heterodox teachings) groups, the local security services are responsible for collecting the information. Another believer who suffered a similar humiliating travel experience is Lin Feng (a pseudonym), also a Christian from the Local Church. Since late 2016, he has traveled by high-speed train four times. Each time, he was summoned and photographed by police at the train station. One police officer told him, “All those who believe in God are ‘dangerous elements.’ We need to interrogate and track your whereabouts, your intentions, and your movements. You can only check in and board the train after the Public Security Bureau agrees.” Lin Feng is enduring this treatment now because he was detained for two weeks – 12 years ago – for sharing the gospel. Local Church members are not the only ones suffering from travel restrictions, as believers from house churches and other religious organizations are also being singled out for harassment. For example, a house church in Heilongjiang Province’s Daqing city established a summer camp in August 2018. Police raided the camp and arrested several college students. The church’s leader was later summoned to the police department for questioning. He was told that he must join the Three-Self Church, and if he refused, he would be blacklisted. He would not be able to travel abroad, or to take a plane or train domestically, and that his children and anyone else who attended his house church meetings could face the same penalties. In another example, a preacher in a Seventh-day Adventist Church in Fengcheng city in Liaoning, was sentenced to ten months in prison in January 2017. 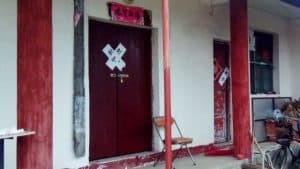 Her crime was supposedly “organizing and using a xie jiao organization to undermine law enforcement” despite the fact that the Seventh-day Adventist Church is not on the official list of xie jiao organizations. Several months after her release, authorities issued a notice prohibiting her from traveling by high-speed train, airplane, or boat. She was only able to travel by the old, low-speed and inconvenient train system. 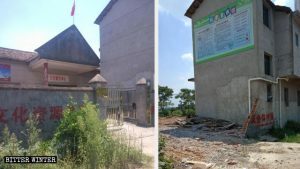 Yet another example of a house church leader facing travel restrictions is the head of the “Good News Church” in Xuzhou city in Jiangsu Province. In February 2018, the police registered his personal information after they arrested him. Since then, he reports being closely monitored by the police, and he is not allowed to buy a train ticket. In November, he succeeded in obtaining a plane ticket to South Korea. However, before he could travel, he was summoned by personnel from the National Security Bureau, who forbade him from leaving his home city. Independent Chinese commentator Zhu Xinxin said in an interview with Voice of America that a notice was published jointly by China’s National Development and Reform Commission, the Civil Aviation Administration, and the China Railway Corporation. The notice states that, as of May 1, 2018, Chinese citizens who have “seriously violated the law” or “been discredited” would be “appropriately restricted” from traveling in airplanes or trains. Chinese dissidents are already paying the price. According to the report by Australian Broadcasting Corporation (ABC), Liu Hu, a resident in Chongqing, in southwest China, was previously an investigative journalist who has uncovered corruption at the top levels of the Party and reported on several human rights cases. In 2017, Liu Hu found himself blacklisted as “dishonest” under the authorities’ pilot social credit scheme. When he tried to use a phone app to book train tickets to Xi’an, the app rejected his purchase. The social credit system has closed down his travel options and kept him under effective house arrest in his hometown. Liu Hu wants to warn the world of the nightmare of social credit because he believes most Chinese don’t yet understand what is coming from the digital totalitarian state.